Lucas Proudfoot is a member of the Tweed Coast Bundjalung/South Sea Islander Community with a background in professional surfing, music and traditional Aboriginal dance. An award-winning songwriter and musician, Lucas has been an Australian Indigenous Education Ambassador and is currently a role model for Books in Homes Australia. He performs his one-man shows in schools throughout Australia and has also travelled to perform in over 25 countries worldwide, including destinations such as Brazil, Mexico, Costa Rica, Spain, France, Portugal, South Africa and Hawaii. Lucas has been able to merge his many talents into a one-man performance that is highly interactive and informative about Australian Indigenous cultures. Lucas’s debut novel ‘Shaka Shaka Hawaii’ was published in 2017, and his series of five books about The Proud Foots are all available from July 2019. The books tell the story of the magical international adventures of three young indigenous animal friends who love to surf and play in a band, The Proud Foots: Pat the Wombat, Koolaz Koala and Billy Blue-Tongue. In 2017 Lucas released his first children’s book – number one in a series of five about The Proud Foots, three young friends who love to surf and play in a band. Pat the Wombat, Koolaz Koala and Billy Blue-Tongue go on fun-filled adventures to other countries, and share their unique Australian culture with new friends. This brand new series is written for young audiences aged 6–10 years. Each story has been carefully crafted to include references to Australia’s diverse Aboriginal and Torres Strait Islander cultures, and showcase other remarkable Indigenous cultures from around the world. The stories are fun and engaging educational tools, intended to inspire young people to learn more about the diversity and vibrancy of different cultures. Sessions in schools are huge fun and highly interactive, with lots of music and dancing! Lucas will focus on the character & story, and also talk about the inspiration behind his writing and why he writes not only books but songs & poetry as well. Stories, music & laughter makes The Proud Foots show a ‘must see’ event for all audiences across the country. Shaka Shaka Hawaii is illustrated by David Hardy, an Indigenous author and illustrator who has worked with Walt Disney Studios on animated feature films, and has written and illustrated several books. Rocking in Japan and What Magic Globe? are illustrated by award-winning Aboriginal and Torres Strait Islander artist Luke Mallie. Circular Rhythm presents Indigenous Australian culture in a dynamic, fun and informative show. Students learn about different aspects of Australian Indigenous culture through contemporary and interactive musical performance. 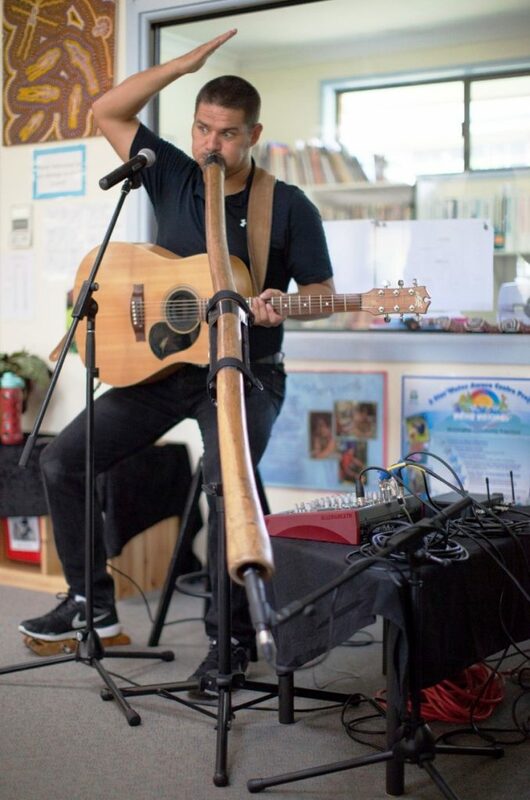 Circular Rhythm is a solo performance featuring guitar, stomp box and didgeridoo plus other indigenous instruments including clap and boomerangs. The format is interactive with audience participation a key component. The songs performed in the show are all original compositions by awarded songwriter, Lucas Proudfoot. Circular Rhythm is an Accredited Education program with Lucas being an ‘Australian Indigenous Education Ambassador’ with DEEWR.